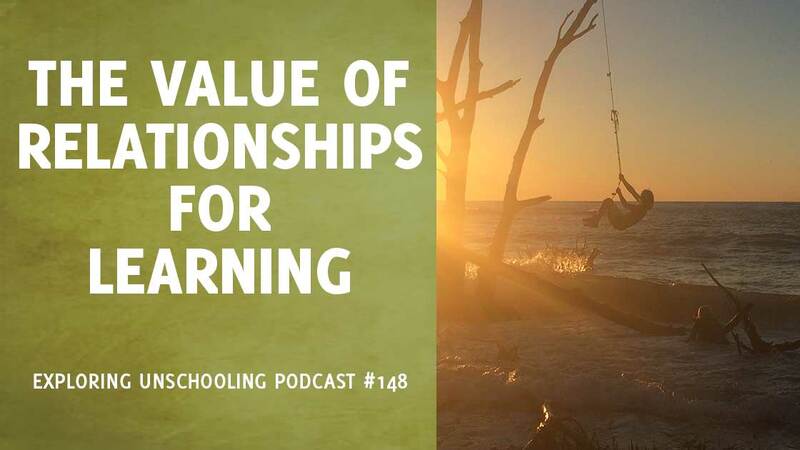 Welcome to The Value of Relationships for Learning! When I began unschooling my three children back in 2002, it wasn’t long before I came across the idea that strong relationships with my children were essential for unschooling—and learning in general—to thrive. At first, I thought, sure, that’s a worthwhile goal, but what exactly does that have to do with their learning? Well, that became clear over the next months and years as I continued to question the conventional wisdom around parenting and how children learn. In this talk, we’re going to explore why connected and trusting relationships with our children lie at the heart of their learning. The first thing I want to do is just take a moment to loosely define unschooling so we’re all starting off on the same foot. Unschooling is a style of homeschooling that, at its most basic, is about learning without a curriculum. It sounds straightforward, but the implications of that simple phrase can be life-changing. It grows beyond an educational method into a learning lifestyle because human beings are hardwired for curiosity, learning, creativity, connection, and engagement. What if we choose to cultivate these traits, rather than trying to control them? When I first began learning about unschooling, it didn’t take long to come across the idea that strong relationships with our children are essential for unschooling and learning to thrive. He packs so many important points into this one sentence! By this he does NOT mean hovering over children. He doesn’t mean jumping in without being asked and doing things for our children. He’s talking about being in relationship WITH them. Caring ABOUT them as human beings, and as our children. Curiously, there’s nothing about teaching in there. Or even learning. Why is that? When my family began unschooling, I saw it as a way to replace school. A different way to learn. And it is. But while we understandably focus on our children’s learning when we set out on our unschooling journey, we soon realize that there’s something even more fundamental that lies underneath: our relationships with our children. We discover that when we focus on cultivating strong and connected relationships, learning naturally and beautifully bubbles up. How does that happen? To explore that question, let’s start with Maslow’s hierarchy of needs. American psychologist Abraham Maslow’s popular theory describes a number of fundamental needs that must be met for a human being to perform to their potential. 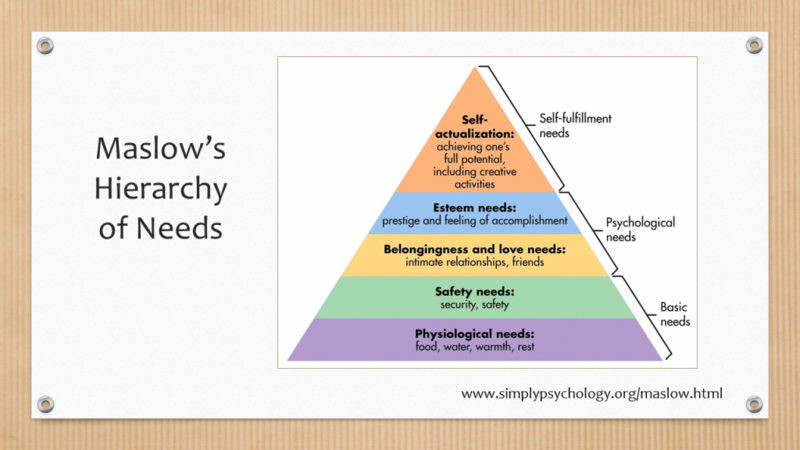 This idea is often visually presented as a pyramid: as a person’s more basic needs are met, they move up the levels, reaching self-actualization needs at the top. It’s important to note that self-actualization is not a destination—it is an ongoing process of personal growth; a practice. Also, that, as circumstances change, we can move up and down the hierarchy. The bottom two needs are the basic survival needs: physiological and safety. These represent the food and water, the warmth and rest, that human beings need for their bodies to function well, and then a safe environment that keeps fear for our well-being at bay. When these needs are unmet, meeting them rightly takes the person’s attention and focus. There’s no attention left for learning. The next two needs are psychological: first, there’s the need to feel a sense of belonging and acceptance—to feel loved; and then there’s esteem, feelings of self-worth, confidence, and control over their lives. Sounds very similar to what John Holt was describing, doesn’t it? Again, meeting these needs take precedence before a person moves up the hierarchy. If they’re regularly feeling negative emotions like rejection and anxiety, elevated stress hormones affect the prefrontal cortex, the amygdala, and the hippocampus, impairing their learning and memory. But once those physical and emotional needs are met reasonably consistently, they can spend their time at the top of Maslow’s hierarchy. It’s here in this curious and creative mindset of exploration where learning thrives. What I find fascinating is that this describes, in psychological research terms, what unschooling parents see in action in our lives. With survival needs met, when we focus on nurturing connected and trusting relationships with our children, we are meeting their emotional needs for belonging, acceptance, and esteem. And it’s at that point when they can spend more of their time steeped in discovery and personal growth, i.e. the learning naturally bubbles up. Now let’s look at things from another angle, through the lens of Hungarian psychologist Mihaly Csikszentmihalyi’s work. What Maslow described as “peak experiences,” a signature occurrence in his self-actualization state of being, Csikszentmihalyi describes as “being in the flow.” It happens most often when we play where the challenge of the task and the skill of the person is closely matched. Flow doesn’t happen if the task is too easy—there lies boredom and apathy; or if it’s too hard—there we are most apt to feel worry or anxiety. I love that phrase because it so clearly portrays what unschooling parents often see with their children. A bit of backstory, my youngest, Michael is a black belt performance martial artist and stunt performer, and my daughter Lissy is a photographer. I mean, they are so much more, but those are their current vocations. 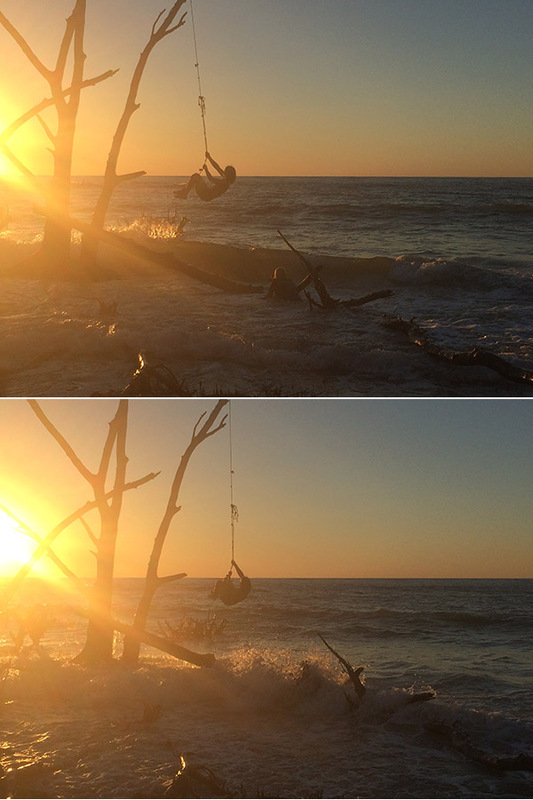 We were on vacation last fall, and one evening we trekked to a secluded beach for sunset. When we got there, we saw a rope swing and, of course, Michael was all over that. A moment later, Lissy grabbed his GoPro and started shooting him in action. They were both in their element—focused and in the flow. It didn’t faze her one bit. In fact, when I showed them the pictures later she only vaguely remembered being engulfed by the wave. Focused and in the flow. And Michael got some great footage. But it’s really difficult to get into the flow when you’re doing something you’re not interested in! That’s why, with unschooling, we’re all about helping our children follow their interests. 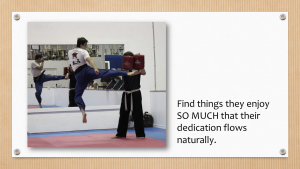 That way, there’s so much more opportunity for flow-state learning. And fun! I sometimes hear the argument that “children need to learn to do things they don’t want to do.” People worry that children will give up too easily when things get challenging, and they need to be forced to keep at it. And that’s an understandable conclusion when looking at schooled children through the lens of conventional schooling and parenting. Yet, that’s not what unschooling parents see in action. We often see our children doggedly pursuing their interests and goals—even through many challenging moments. Free to choose what they do, the intrinsic motivation to keep going in spite of the obstacles they sometimes encounter is inspiring to watch! I took this picture at Michael’s black belt grading, on his 17th birthday. I’d guess this was around hour five of an intense eight hour grading. Parents don’t need to teach this kind of unwavering commitment by requiring it in everything their children do. Instead, we can help them explore the world and find things that they enjoy SO MUCH that their dedication flows naturally. Which also means being free to quit activities when their interest wanes. There’s so much learning in that choice as well. That lack of self-consciousness is key to flow—needing to be vigilant about the people around you is distracting. And again, unschooling parents are focused on creating an emotionally safe place for their children to explore and learn. In Maslow’s terms, meeting their psychological needs. This, in turn, allows their children to sink into the flow of their activity more often, reaching the top of Maslow’s hierarchy—the curious and creative mindset where learning thrives. We don’t need to focus on the learning at all. Instead, we can focus on creating cultivating an environment in which learning naturally bubbles up: the emotionally safe space of connected and trusting relationships. That brings us to the next big question: How do we go about nurturing strong relationships with our children? Strong relationships are built on strong connections. In a well-connected parent-child relationship there is a high level of trust and genuine respect. Days are a dance of give-and-take. That doesn’t mean it’s effortless. But if we want to develop more connected relationships with our children, we can choose to make the effort. There are a couple of things that I often see get in the way when a parent is trying to connect or reconnect with a child. The first is the parent not honestly evaluating how actively they cultivate connecting opportunities when they appear. Pay attention to how you respond to your children when they reach out to you. When they ask you for help, do you most often say yes? Do you consistently help right away, or put them off until it’s more convenient for you? And do you follow through? Looking at these questions can help you see the signals you are giving them regarding your availability for connection. Each of these situations, if they occur with any regularity, interferes with the healthy give-and-take of a relationship. The other is that often a parent tries to connect by attempting to pull the child to them rather than going to the child: “Want to go for a bike ride with me?” The answer is often no because as part of the relationship disconnect the child likely doesn’t trust that you are suggesting the activity for their enjoyment. And are you really? Do you truly think it is something your child would enjoy, or is it really something that you would enjoy doing with them? There’s an incredibly important difference there. Instead, go to them. Join your children in activities they enjoy. And not just family activities that everyone enjoys together, but different activities with each child, based on their individual interests. Go fly a kite. Take the time to see the world through their eyes. Spend some time quietly observing them so you start to see what kinds of things they like to do. Make getting to know them one of your high priority projects. Watch the TV shows and movies they like with them. No need to make conversation to connect; your relaxed presence is a starting point for building future connections. Let them just get used to your company. Maybe play their favourite board or video games with them. If they don’t yet want you to play with them, don’t take it personally; sit nearby and soak up their joy. Take your direction from them. But don’t do these things passively; passionately spend this time observing and learning more about them. Creating a strong base of connection and trust on which to build a relationship is not about putting in time with your child but about using that time to celebrate what makes them wonderfully themselves: the activities they enjoy, the food they like to eat, the kinds of clothes they prefer to wear—and understanding why. Once you begin to understand your children as individuals, you can begin to connect with each of them where they are—that is the comfortable place from which they can welcome you. Through your actions show them that you understand and love the unique individual they are. And that’s a true connection: proof that you see them, that you understand who they really are. Now, we’ve dug pretty deep into ways to build connections in our relationships with our children. What about trust? In my experience, trust has been the backbone of our unschooling lives. And that trust goes both ways: my trust in them, and their trust in me. Developing this deep level of trust doesn’t happen overnight—it is built over time and through experience. How can we cultivate our children’s trust in us? By being responsive: consistently available when they need our help and support. By being loving: showing our love consistently in words and actions. By being trustworthy: helping them get their needs met; instead of trying to cajole or control them into meeting our goals. Now, on the flip side, how can we develop trust in our children? By being open and approachable: engage with our children whenever they want to connect. But don’t equate trusting your children with leaving them on their own. Those are different things. You can trust your children, yet they still need you around to help out: you have more experience to add to the moment. You can help make experiences richer. If you take that trust to mean you are no longer needed, you will be less involved in their lives and your connections will begin to fade. Instead, if you focus on your relationships, on building connections and trust, what grows out of that is true respect, a deep sense of the inherent worth of each of your children, which will most likely be reciprocated in abundance as you use this strong base of understanding and connection to build uniquely wonderful relationships together. It’s fascinating to see how research about human needs and learning meshes so tightly with observations from experienced unschooling parents. So now, to pull it all together, let’s look at how these connected and trusting relationships play out day-to-day. How do they so effectively support our children’s learning? When parents who know their children’s likes, dislikes and personalities find more interesting things to bring into their lives—this enriches their children’s learning. When children feel safe and understood, they are more apt to try things out without worrying about feeling judged—this deepens their learning. When parents understand their children well, their choices and actions no longer seem arbitrary, and they are more able to trust them when their motivations aren’t yet clear—this expands their children’s learning. And when both parents and children are more comfortable approaching each other for candid conversations—their self-awareness grows. As our children get older, conversations often centre less around facts, and more around thoughts, feelings, morality, principles, and behaviour. Topics that help them sort out the kind of person they want to be. That’s an important bit: the person they want to be. With your love and support, your trust and connection, you are a valuable part of this process. And that is where unschooling shines. When my family first began unschooling, I had no idea that it would lead me to develop such marvellously connected and trusting relationships with my children. But looking back now, it all makes so much sense.